Coming up with Christmas gift ideas for husbands is almost as hard as deciding what to put in your teen’s stocking! It’s time to get down to making our lists and checking it twice, though! Christmas is so close that I can almost smell the roasted chestnuts, nutmeg-infused eggnog, and the dozen freshly-baked sugar cookies that I make every year. Okay, okay, I must admit: Christmas is not only about the food, but it’s definitely a plus! All jokes aside, the holidays are all about thinking of others and providing loved ones with complete joy and happiness. Today, I put together some fantastic stocking-stuffer ideas for your hubby. Our husbands are our “partners in crime,” so we obviously want the best for them. Take a look at these five great gift ideas – they’re original, budget friendly, and items that he’ll definitely get great use out of! If your hubby is one to really take care of his beard/shave, then this year, sneak in some grooming products in his stocking. Does he sport a full-out beard? If so, he will truly appreciate a beard oil like this one by Percy Nobleman. Beard oils are essential in keeping the hairs thick and healthy, and Nobleman’s boasts an amazing musky vanilla fragrance. Is your man one for a closer shave? Then throw in a shake kit like this luxury set that contains a 100% pure badger hair brush, apothecary mug, shave soap, and a brush and razor stand. Hubby will definitely love all of his new grooming accessories! Is your husband always on the go? Lately, battery banks have been extremely popular and for a great reason: they are the ultimate accessory for your mobile device. Battery banks allow you to carry that extra bit of battery juice so you have something to turn to when your phone is running low and you need to make that extra phone call. We love this one from Anker . It boasts a sleek design and has an amazing capacity. It can hold up to two full phone charges and is one of Amazon’s top sellers. Keep your husband warm this winter with a pair of high-quality driving gloves. A pair like these are versatile and fashionable. Forget those overly-bulky, traditional winter gloves. Give your hubby something that will give him a good grip on the steering while still keeping his sense of fashion in mind. My husband seems to keep the same wallet for years. I, on the other hand, love changing mine depending on the season’s “it” color, style, design, etc. Fossil wallets never cease to amaze me. Their leather is stunning and ages so beautifully. The Derrick Bifold style is one of their most popular ones. It carries a slender look and has great compartments. If your husband loves to kick back with a cold beverage after a long day, then surprise him with a box of Whiskey Stones . Whiskey stones are ideal for keeping all his favorite drinks (including non-alcoholic, don’t let the name fool you!) cool and undiluted. Simply place them in your glass so you don’t have to compromise your drink’s flavor. They’re designed with great detail and practicality. For example, they feature rounded corners so that you can avoid scratching up your glasses. These stones look classy and would make a fantastic addition to your husband’s stocking this year. You might want to grab a set of your own to chill your favorite mocktail recipe! Do you have any other Christmas gift ideas for husbands? Would he enjoy any of the items I listed? Let me know in the comments below! Thanks for the ideas – my husband and I only exchange stocking stuffers so Im always looking for new ideas! My hubby is so hard to shop for!!! Thanks for the great gift ideas. I can’t believe it’s time to start shopping. 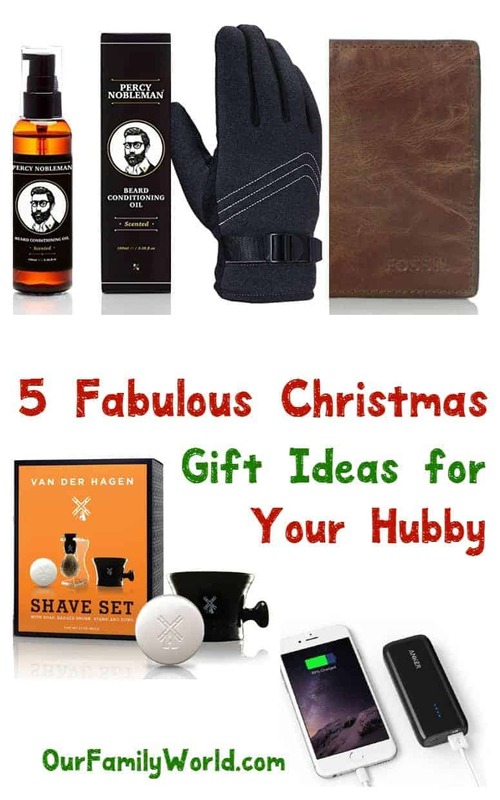 My husband would appreciate any tech-y gifts like the charger or the grooming products. It’s time to start shopping. I don’t have a husband but I do shop for my Dad and Grandpa. My Dad loves anything and everything music related so that is always my go category to shop for him. This is a really good list as I never know what to get him. I love the wallet, battery bank and the driving gloves. BEARD GOODIES!!! I know my hubs will laugh, but totally appreciate, these items! His beard is going gray and it needs all the love it can get! I have some whiskey stones in our frezer. I keep forgetting to use them. Maybe I’ll wrap them up again. Oh, I love the Whiskey Stones! What a great idea. Thank you. I’ve been thinking about what to give to my husband this Christmas! It’s so stressful and it’s always so difficult to shop for him! This list will help narrow down my choices! I always struggle for gifts when it comes to men. It’s so difficult to shop for them, at least that’s how I feel. I really appreciate this gift ideas! My husband would love a battery bank. He always seems to lose his.